CC Road Trip: Anyone Up for a Beater Challenge? My car, a 2003 Honda Civic, was a boring choice. They would have liked to have known about it ahead of time. For either participation or spectating. I have a solution for both! Here is your notice solving the second problem. The 2018 edition is scheduled for August 25-26, 2018. 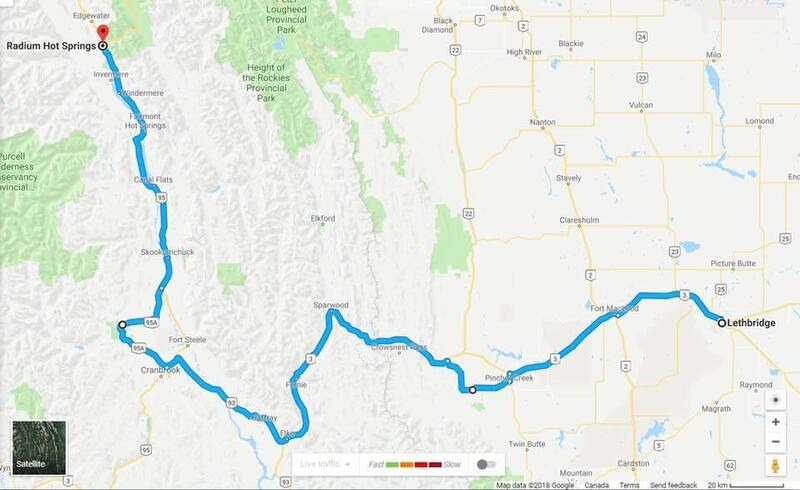 The route has also been posted. 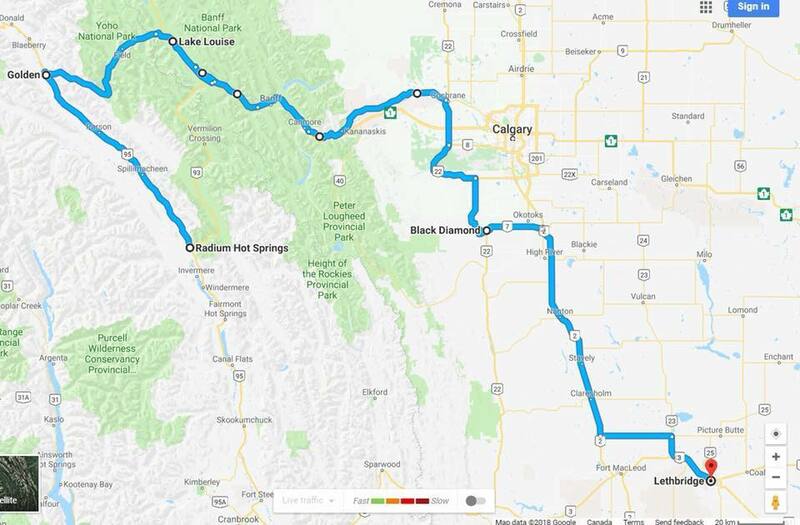 It starts and ends in Lethbridge, Alberta while offering some very scenic driving through the Rocky Mountains. See the event Facebook page or official website if you would like to participate. As for the first problem of a too reliable, boring car I have that one solved as well. This year’s choice of car will be revealed soon. Hmm, I was thinking I could make it a motorcycle trip with my 1993 Kawi Concours, but I seem to recall a lot of gravel on previous routes. No gravel (or very, very little) this year. 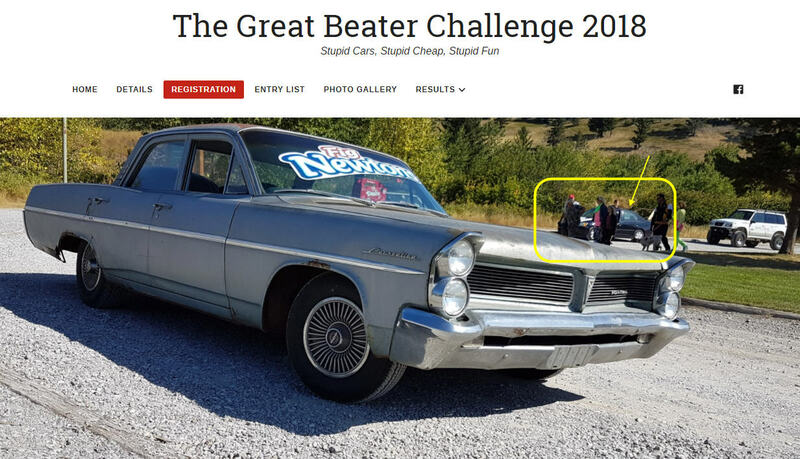 Is that your team’s infamous Honda Civic from last year’s challenge highlighted in the picture below, David? If it is, you made the cover page on the official website! Yes that is my Civic. It has been de-winged and now lives on as the kids car. I drove it yesterday in fact. I actually took that photo as well. Oddly the Pontiac team never got hassled by the police for their windshield banner. Yay! I’m all in. I already have my vehicle. I happen to need a van/minivan for a move happening in April or May. 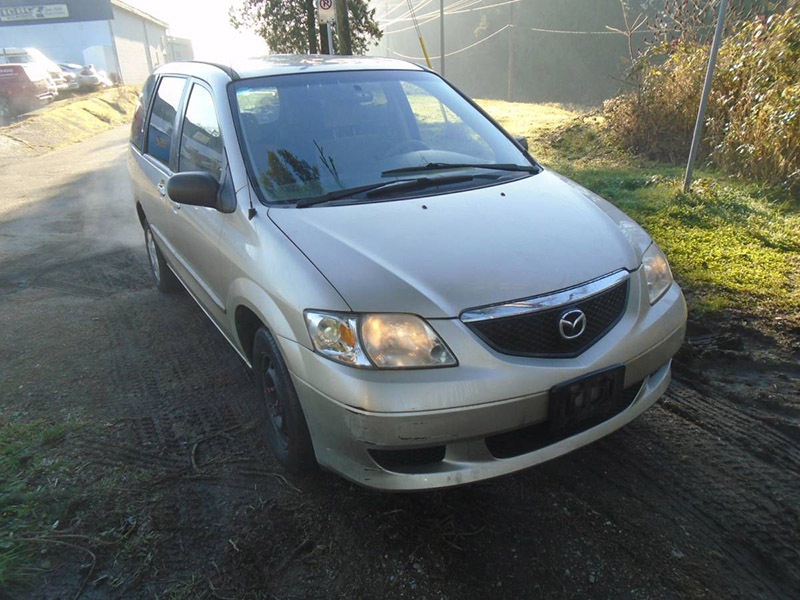 I Bought a beater 2003 Mazda MPV for $500. I hope it lasts til August, as it’s my daily driver at the moment. It doesn’t look too bad in the photo, but it’s got lots of big scrapes. I’m going to toss the back seats and throw in a foam mattress so that I can camp in it. From your sneak peak image, I’d say your car is a K-car, maybe a Lebaron/town & country? Oh wait, is it the Aires you have in 2016? Yes – that is the Airies from 2016. I’ve bought a much older car for this but it isn’t roadworthy yet. I believe you get bonus points for sleeping in your vehicle. Do the bonus points go up depending on the comfort level of your vehicle? Sleeping in an Isetta or Lotus 7? +1000! Ooh, I’ve been wondering about these for a while. It’s a bunch of Protege hardware, right? Proteges do great in LeMons! Protege hardware? Don’t think so. It’s got a 3 litre V6. And some small electrical issues. 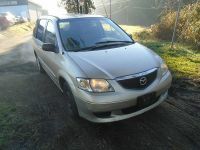 I wanted an early Gen MPV, but this one came along. I was also hoping to find a GM Dustbuster. Would love to do a Great Beater Challenge but money’s tight right now. Got the perfect beater tho, a sweet 158k mile ’05 Crown Vic P71 🙂 . I’ve got a beater, but I’d have to travel further than the trip itself to participate. I love the idea, and when you’re having one that goes through Tail of the Dragon, count me in. Maybe start at the Lane Museum? I’m traveling from Vancouver BC, so I hope I get there. It’s August, what could go wrong? That first pic looks like a K-car instrument panel. …..edit: Click this link instead. It’s part 2 where David selected his car…. Yes I should clarify – that the K-car from the last challenge. The current car is much older and bigger. This is…tempting. The starting line is only 902 miles away from me. That’s closer than Detroit or Auburn was…Mr. J. Shafer, how about you come and pick ME up this time? There’s a Quantum Syncro Wagon currently for sale locally for $500. The front left headlight is crushed (ok the fender too a bit), but hey, what could go wrong? Jim, I would come pick you up. Even though I have remained quiet, this has tempted me mightily. Technically I could enter as I paid nothing for the Galaxie and my dad paid $200 for it. But I haven’t read the rules, so I may be SOL. But there’s lots of other choices, too. Uh-Oh, is this turning into the 2018 CC Meetup? It’s only 832 miles from Eugene. So what shall I drive? The F100 or the Chinook? I’m thinking the Chinook would offer much better accommodations at night. And I won’t need a heater, as its heater fan is dead. Otherwise, it’s as good to go as ever…. You could tow one with the other and bring both! Both! Only the F100 has a tow hitch, but it pulling the Chinook might be a bit much for it. Technically, neither of them qualifies, as I’ve spent a bit more on them than $700. But I’ve had the Ford 30 years and the Chinook 15 years, so obviously they needed a few repairs along the way. It kind of doesn’t work for beaters one has had a long time. Actually, what makes more sense is to tow the F100 with the Promaster, which should be done by then. Doug, just bring the Bug. Remember, EVERYthing you have ever done to improve it could be considered a “safety” item… 🙂 And I can return your book to you in person and save the postage. Depends on how much you spent on repairs. Remember safety items are not included (tires, brakes, etc). It would be fantastic to get some CCers out! I read the rules, if you just want to do the event in a car but are over the dollar limit or can’t be bothered that’s fine, you’re just not eligible for prizes. Who gives a rip? Prize for me would be a couple of days riding in the mountains and hang out with some CC people. Is there a statute of limitations for repairs? I spent over $500 (cough, cough) on the old Galaxie four years ago. Except for the biannual water pump, I’ve spent zero since. Just need to buy one of those window swamp coolers. They work well in that part of the world. Unfortunately I had to toss my 1990 Pontiac Trans Sport a few months ago before the rear suspension collapsed from rust issues. No exaggation – the left rear coil spring was halfway through the mount. All part of the rear axle assembly. Maybe I could have found a junkyard unit, but there were a dozen other problems, besides no airbags or anything. The spare tire had already disappeared. Anyhow, it would have made the trip no problem. Many years ago a woman friend of mine had an ex-husband who owned a Citroen DS 21. She said he went to the yearly club national meeting, but of course a certain number of members never actually got there. Not the Trans Sport! GM rules! I have a Subaru now. The overnight stop is about 10 mins from my home…and I’ll be in Manitoba for my brother’s wedding that weekend. Bummer, I’d have no problem finding suitable beaters for the challenge. My old neighbour is selling a very ugly ’55 International 4×4 that would steal the show…and also hold up traffic on the highway. While intriguing, the start point is over 1,800 miles from me, not to mention the only points I could score would be for driving a defunct auto brand (which wouldn’t be eligible for prizes anyway due to it being less than a year old, drat the luck). OTOH, maybe I could get one of the Bugs running by then? Wouldn’t come in under the $700 budget, though, unless I simply bolted the ’63 back together and ran it ‘as-is’ (paid $600 for it). Head north a bit and just have DougD pick you up at a rest stop on Canada’s best highway. What could go wrong? The 1998 Saturn Sky was never made with 4 doors and was not produced until 2006. Was wondering how long it would take for someone to spot that… the car in the ad was indeed a four door sedan, not a Sky. Heh, will turn over—given enough rotational force. I should try to get my dad to enter this years challenge with his older Mercedes wagon he traded for a case of wine. Although by this point, a couple of years later, I am sure it has gone passed the $700 mark. 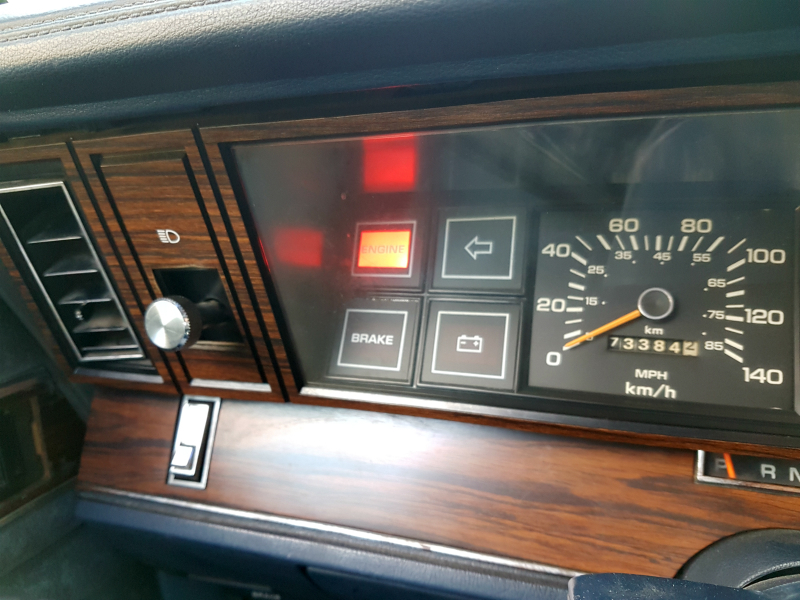 My buddy just picked up a grande marquis for $750 maybe he can sell $50 worth of parts to qualify.